Hundreds of people turned out for a community open day to revisit the QEII Park site and help plan its future. 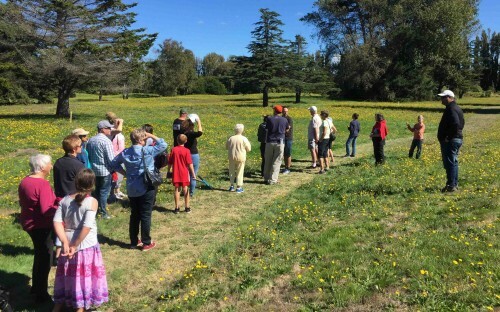 A crowd of over 400 attended the event on Sunday, enjoying a walking tour of the park, fun activities for children and a sausage sizzle as well as sharing their ideas and values for the park. About 345 comments and questions were received by Council staff. The Council is developing a master plan to help determine the future of the park, which surrounds the new $38.6 million QEII Park Sport and Recreation Centre due to open in June. The previous facility was damaged in the Canterbury earthquakes and demolished in 2012. The goal of the QEII Park master plan is to make sure the environment and buildings are connected and the area works well for the community long-term. The open day was the first step towards getting community input. People have the chance to give their initial feedback online on the QEII plans until Monday 9th April. Coastal-Burwood Community Board Chair Kim Money says it was great to see such a high level of community interest. “The board is absolutely thrilled with the response. We know that local residents are really passionate about this park, and they showed us that by turning out in droves." Some features are already set in stone, including the new pool complex which is set to open on Queen’s Birthday Weekend, an area leased to the Christchurch School of Gymnastics, and the land set aside for the combined Shirley Boys High and Avonside Girls’ High combined school campus. Funding gained from land sold to the Ministry of Education in 2016 for the new school campus has been set aside for the redevelopment and implementation of a master plan. Council Recreation and Sports Planner Lizzy Farthing says the event had an upbeat atmosphere. “The feedback was very positive, people were very engaged and ready for this opportunity to talk about the future of QEII. A Council project team will assess the feedback from the open day and the Have Your Say page and a draft master plan will go out for full consultation when it is complete. Get more information and the latest updates on the QEII site. You can also email the Christchurch City Council (qeii[at]ccc.govt.nz).